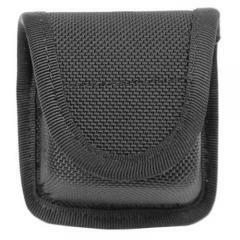 This Taser cartridge pouch from Blackhawk has the professional appearance of molded nylon, but is actually made from Cordura for improved abrasion resistance. The molded construction and four layer laminate also make it highly resistant to crushing, giving the contents superior protection against all kinds of hazards. Inside, water-resistant closed cell foam prevents water intrusion and provides cushioning for additional protection from impacts and vibrations. The top flap provides additional retention, and fastens using a hook-and-loop area for enhanced security. The sturdy belt loop allows it to ride conveniently at the waist, and attaches to a belt up to 2.5 inches wide.